Mick Hartley: But Is It Art? What are we to make of this trial in Avignon? When Rindy Sam left a lipstick "kiss" across a piece of pristine white canvas it was, she claims, an act of love. But to the art collector whose painting she modified, Sam's act was nothing more than vandalism. Yesterday the argument came to court, where Sam is being sued for more than 2 million by the owner of the painting - part of a tryptich entitled Phaedrus by the contemporary American artist Cy Twombly. A Cambodian-born Frenchwoman, Sam, 30, was arrested in July after smearing lipstick over the painting during an exhibition dedicated to Twombly's work in Avignon in southern France. Her trial, which opened in Avignon yesterday, came three days after a drunken gang broke into the Musée d'Orsay in Paris and punched a hole in a painting by the French Impressionist Claude Monet, sparking a debate about security in French museums. Sam, who claims to be an artist herself, is being sued by the owner of the painting, art collector Yvon Lambert, who organised the exhibition of Twombly's work. The young artist said she was overcome by the power of Twombly's work and issued a statement before the court case, distancing herself from the attack on the Monet painting. "On the one hand you have a revoltingly bestial act of cruelty, on the other a pure, intense act of love. Rindy's gesture was an artistic act provoked by the power of art," her statement said. "I take responsibility for my act. This white canvas inspired me. I am told it is forbidden to do such things, but it was totally spontaneous," it continued. "I just gave a kiss. It was a gesture of love; when I kissed it, I did not think it out carefully, I just thought the artist would understand." I think we should maintain a certain scepticism about Ms Rindy's explanation (there seems to be some confusion about whether it's Rindy Sam or Sam Rindy: I'll go for the latter). That's a rather large mark for a kiss supposedly planted in a moment of spontaneous enthusiasm. According to this account, she'll pay a fine of 4,500 euros if convicted, which isn't a bad price for all the publicity. On the other hand it surely can't be that difficult for the owner of the painting to obtain a new pristine white canvas (from his local art supplies dealer - see Yellow Pages) to replace the old one. Or would that somehow destroy the integrity of the original work? What if it was the artist himself, Cy Twombly, who purchased the new canvas? What if, instead of planting a kiss, someone had snuck into the gallery and substituted a new pristine white canvas for the original pristine white canvas? Only they would know the difference. They'd have acquired a Twombly original....but it would be worthless. There are profound issues at stake here. 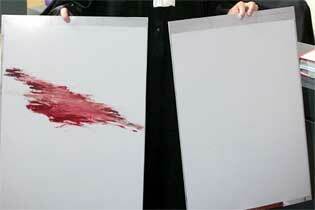 Maybe Twombly should sue artists' supply stores that sell blank canvases. Those are obvious forgeries. It's a canvas that's been painted white, not a blank canvas. And it's not just an even, flat white. I've seen the painting: you can see the hand of the artist at work in the way the paint is layered. It's subtle, and beautiful. Or, was.